Christmas seems to come earlier every year – or at least that’s the impression you get whenever you walk into a supermarket or department store around this time of year. However, when you’re planning something as monumental and year-defining as the company Christmas party it’s definitely a good idea to start as early as possible. We at The Talent have performed at enough Christmas parties and corporate events around the world to understand just how crucial the planning stage of such an event is. So, we’re here to help with our top five tips for planning the perfect company Christmas party. Sure, Autumn’s only just begun – yes, there are still leaves on the trees – but step inside any shop and what do you see? Christmas décor galore! The point is, it’s never too early to start planning your company’s Christmas party. If you’re planning something with as many logistical moving parts as a corporate party, you’ll want to give yourself as much time as possible. First things first, you’ll want to establish the date and time of the party. The best way of doing this is to send out provisional dates and times to all staff and let majority rule. Once you’ve got a date and time set for your party, you’ll next want to put together a guest list; knowing how many people are actually planning on attending will inform how big your budget will need to be. The next logical step is forming a Christmas party committee. This allows you to share the responsibility of tasks ahead as well as bounce ideas off each other. It’s important to pull in members from various departments so everyone in the company feels represented. Lastly, don’t be afraid to delegate responsibility, rather than trying to take everything on yourself. Just as Santa would do with his workshop elves, you shouldn’t shy away from putting your little helpers to work. Just make sure that each person on the committee knows exactly what he or she is responsible for – the best way of doing this is to assign each task in writing through a shared document. Put one or two people in charge of food and beverages, another person in charge of entertainment, and so on; there’s also venue hire, decoration, transportation – these can all be assigned to individuals or groups. By assigning these various tasks to other people, you’re able to better manage and oversee the whole project. How Big is Santa’s Budget? Nailing down the party’s budget early on is crucial, as everything else will depend on this. Just like with the initial stages of planning, the sooner this can be done, the better. In allocating budget, your boss is going to want to know how many are planning on attending and what you’re planning on spending your budget on, so be ready have cost projection for every aspect of the party. An invaluable asset in putting this estimate together is talking with former Christmas party planners to find out how much was spent on previous Christmas parties. Don’t be haunted by the ghosts of Christmas parties past; be sure to take note of what’s worked in the past, and what hasn’t. Once you’re ready to present this information to your boss, you should be able to get the maximum spend per person. Now that you have your overall budget, make sure your boss and everyone on your team are clear on exactly what costs will be incurred: food, drink, entertainment, transport, venue rental, decorations. Next, you’ll have to assign budgets for each of these aspects so that your elves can work their magic. Unless your company already has an appropriate space, finding the right venue can be a daunting and time-consuming undertaking. The sooner you start looking, the more choices you’ll have. The size of the budget and guest list for your Christmas party will obviously dictate to a large degree the type of space you’re looking for. Also knowing your party’s theme and whether it will be a daytime or evening event will inform your choice of venue. Just as important as having a dedicated and creative team in charge of decorations and set-up is delegating a crew who are responsible for break-down and cleaning up the venue after the party. Make sure everyone on your clean-up team knows in advance (and in writing) what their role is. Your hired venue might be able to help out with clean-up afterwards, but this is definitely something you need to have figured out early on in the planning stage. Another very important thing to consider is whether or not you will arrange transportation to and from the event. It’s important to have a contingency plan for when Santa and the elves have imbibed a few too many Christmas spirits at the end of what will undoubtedly be a very successful party. Providing a shuttle or taxi service from the event could be a necessary spend to avoid any unnecessary accidents or mishaps. Make sure any relevant transport information is made readily available to everyone attending well in advance of the party. Last, but most certainly not least, having the right live music can make or break a corporate Christmas Party (or any party, for that matter!). ‘Tis the Season to be rocking, swinging or swaying (or whatever you like to do to your favourite music). Regardless of what kind of band you’re looking for, we’ve got you covered. From our amazing repertoire of 500 plus songs to our flexible line-up, we’ve got the Talent for your event. We’ll have all the elves in your workshop rockin’ around with Christmas glee. 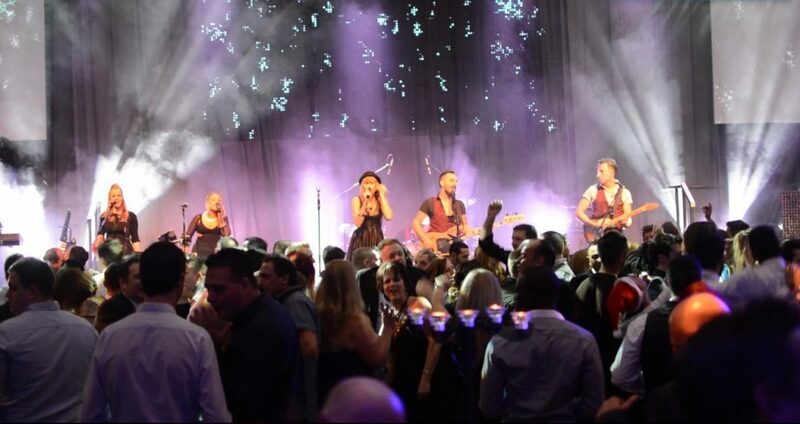 If you’re looking for corporate band hire in London this holiday season, contact us today to find what The Talent can bring to your next Christmas Party.